Note: This post is the start of a series called the 5 Ws of Sublimation. The traditional five Ws are who, what, when, where and why. For the purposes of this series, however, I’m changing the five Ws to who, what, why, which and when. This post deals with what sorts of goods can be sublimated. Sublimation is attractive to many people because of the wide variety of items that can be sublimated. 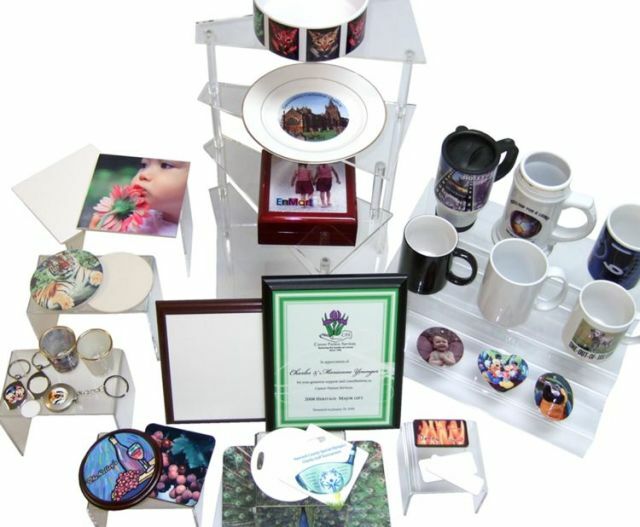 From garments to mousepads to coffee mugs to canvas bags, sublimation offers decorators a vast array of options. If you’re planning to add sublimation to your shop, or already sublimate but are looking for more options for products you can offer, here are a few categories of items that can be sublimated. Drinkware– From latte mugs to beer mugs to the good old fashioned mug you drink from at the local diner, there are a number of options when it comes to drinkware. Coffee mugs are probably the most popular and the most well known sublimated drinkware option, but there are also beer mugs and water bottles. Travel mugs are another popular option. Tags – Everyone likes to be able to identify their luggage or sports bag and many companies also have employees that wear name tags, so tags that can be sublimated are a useful item. Whether it’s a luggage tag for your resident road warrior, a personalized license plate for a company car, or a name tag for the local restaurant’s newest employee, personalized tags can sell very well. You should also remember that pet tags can be best sellers too. Key Chains – Key chains are another great product that can easily be sold to corporate clients. The local car dealership would probably love to have key chains with their logo and company info to give out to new car buyers. Key chains with little added extras like a tape measure would be a great giveaway for a hardware store. I could go on and on about the many products, both hard goods and soft, that can be sublimated, but the reality is that almost anything you can think of can be sublimated, provided it can withstand the heat and pressure necessary for sublimation, and provided it has a poly coating. Items that cannot fit into a traditional heat press can often be sublimated with a wrap and an oven. Innovation and experimentation have led to many options for those who want to offer a wide variety of sublimated products. The other item which must be mentioned when discussing what can be sublimated is, of course, fabric. To get the best sublimated image, you fabric should be 100% polyester and it should be a light color. White is preferable for colors to be their truest, but images are sublimated on fabric that is light grey, light blue, light pink and other light colors. One popular manufacturer of performance wear and t-shirts for sublimation is Vapor Apparel. Please keep in mind that sublimation cannot be done on dark garments. There is no option for a white underbase when it comes to sublimation. You should also keep in mind the fact that blended garments, a poly/cotton blend for instance, will give you an uneven sublimated image. Some people like the distressed look that sublimating a blended garment can cause, but for the best sublimated image possible, it is always recommended that your fabric be 100% polyester in a light color.